Salted Caramel Pretzel Bark Mama Say What?! | Mama Say What?! While browsing Pinterest the other day, I found a pin that made my heart stop, my mouth water and my pants bulge all at once (yes, that’s possible). It’s called Salted Caramel Pretzel Bark… but I just call it heaven. You most likely have the five ingredients you need in your pantry/fridge already. If you don’t, it’s worth a quick trip to the store. It’s that simple! Seriously, the hardest part of this recipe is NOT eating it all. Quick tip: I found it tastes best when right out of the freezer. It will start to melt after sitting on the counter top for more than a few minutes. This would make the perfect gift for your child’s daycare teacher, for a summer BBQ, a housewarming gift… or just because it’s, you know, Tuesday. I’ve made it three times already and be warned, you’ll be looking for reasons to make it (anyone want me to make it for them? Seriously, I don’t mind). Added by MaryEllen M. on July 13, 2012. I just made this recipe and I had it in the freeze for about 3 hrs. when i took it out and tried to break it up, it was still very sticky on the bottom and the foil stuck to it. Should I put it back in the freezer for awhile or is this the way it is suppose to be? Thanks. Yes, it’s super sticky, no matter what. Parchment paper seems to be a bit better, or you can lightly grease the tinfoil wiht butter or spray. I’ve made this half a dozen times in the past two months-everyone loves it. I did it with parchment paper this year, sooooooooo much better! I made this for New Years Eve and purposely cooked it longer on the stove, to almost the hard crack stage. I wanted more of a toffee than a true caramel. Also I added about an extra half cup of brown sugar and a cpl tsp of vanilla. It came out amazing! Think of a Heath or Score bar but way better (with the pretzels you don’t get the overly hardness of normal toffee, plus the salt, Yum!)!! Everyone loved it!! And I didn’t have to worry about keeping it in the freezer like some were saying they had to. But I imagine the hardness I had was comparable to the frozen version. Thanks for the recipe and idea!! AMAZING! When i made this i actually made plain chocolate pretzel bark first and tossed it in the fridge to solidify (i use parchment paper for lining the pan). For the caramel i instead used white sugar and caramelized just the dry sugar in a saute pan. Once the sugar was completely caramelized i added one stick of butter and whisked until combined. Finally i spread the caramel over the chilled chocolate bark. This method definitely takes longer but it actually gives you a brittle type caramel thats crunchy and not at all sticky even at room temp. I made this the other day. Used half white/half brown sugar just because I didn’t have enough brown. I guess I cooked mine long enough because it wasn’t sticky at all. Hard to stop eating it. So yummy it’s amazing. Thanks for the great recipe! Actually, the trick to avoiding the caramel sticking to the foil is to cook the caramel longer. My caramel stays on the stove on a medium low heat for about 10 to 15 minutes. I stir occasionally. If I cook the caramel a shorter amount of time, it will always stick to the foil and will often be kind of liquidy once out of the freezer. I end up throwing it away (what a waste!). The thicker the caramel, the less it sticks. Once I discovered that, perfect bark every time! My daughter-in-law gave me a similar recipe using saltine crackers–did not put on foil but once candy hardens, it is a bit difficult to cut and remove. But oh, so good! 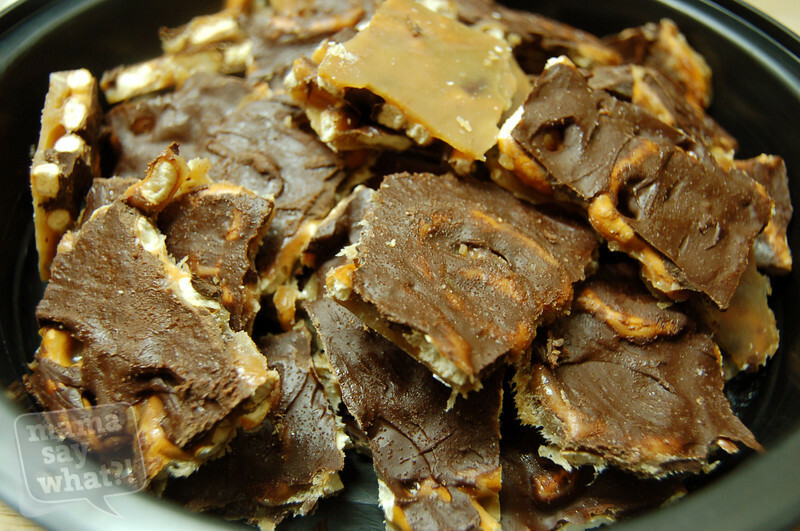 I love this pretzel bark recipe and the cracker recipe is good too. I have learn to line my cookie sheet with foil then use a stick of butter to rub all over the foil, had no sticking problems! Have you tried lining crackers in cookie sheet, melt 1 stick butter and add 1 cup sugar stir well, pour over crackers, put in over until all bubbly take out sprinkle chocolate chips and white chocolate chips put back in oven to melt chips then spread over crackers…..mmmmmm what we can do with chocolate a girls best friend! Made this for my daughter’s teachers Christmas presents this year. They all loved it and wanted the recipe!!! Man those look and sound amazing! You could deff make some for me! Ha I love pretzels and heck chocolate and sea salt caramel too! That’s heaven! We won’t think about calories when these are in our hands! This looks awesome – I’m going to try it. Thanks for sharing this wonderful recipe! I added almonds to mine! Just make sure you add them after you spread the chocolate; it works much better that way! My friends & family can’t get enough of this! This recipe is evil, and I MUST make it! Thanks Mary Ellen! At the moment, I like this article best because I’m pregnant and this is perfect for my cravings! I tried the butter and brown sugar part of the recipe twice and both times was a fail. The first time it never really thickened and then ended up burning, so the second time I didn’t want it to burn and it still didn’t thicken up. I sure can’t figure out what I am doing. Looks so yummy!!! I did the same thing. Does the humidity have any effect on it? It tastes amazing, but not the right consistency. Be sure to keep stirring – if you walk away it will burn. Try melting on only a low or medium setting also. Definitely make sure the stove is on low setting and the caramel is only making a few bubbles. It took me about 20 minutes and I used white sugar. It came out beautiful. The bark hardens right upon cooling and does not stick at all. I did not even bother to freeze. Sorry that your first attempt wasn’t a success The times that I’ve made it, I stirred the butter and brown sugar over medium heat until it got thick…probably 5 minutes? Good luck next time! Mary Ellen, I haven’t made this yet, but have a question. We’re using salted pretzels, right? And then we are generously sprinkling with salt? Seems like a lot of salt – and I don’t want to overdue it. Can you give me an idea of how much “generously sprinkling” is? Thanks. I have a similar recipe and you can use saltine cracker, ritz crackers, graham crackers also for the base instead of pretzels and just as delicious…. I have made it for years with saltines and just recently with graham crackers. Pretzels sounds incredible! Thanks for the question Diane! Yes, I used salted pretzels, but I assume unsalted would work just as well. I used regular table salt when I made mine (because I didn’t have sea salt) and sprinkled less than 1/2 tsp. over the entire tray. Hope that helps! You could also use the butter snaps. I use those for my other pretzel/choc treats…very yummy! and for those of us you love uniformity…nothing beats a square! I do mine with saltine crackers instead of the pretzels and I can’t stop eating them. It’s the mixture of salty and sweet that is so good. Next time I will have to try the pretzels. Us too! I love saltine candy, and my little corn syrup allergic one can eat it happily. i prefer it without chocolate, though. I’m making these tonight, but, as I always do with anything asking for chocolate chips, they will definitely be milk chocolate! Can’t wait!!! Made these! They were great. I forgot to add salt, but they didn’t need it. You commented about eating it right after you take out of the freezer because it would start melting. How well does it work to give as a gift? Does the chocolate start melting together in the packaging? I think it tastes best right out of the freezer, especially on hot days. But it still works well for gifts – I made this for my room parents this year in my classroom. I packed the bark in plastic gift bags (like goody bags) right after breaking it up after it had cooled. I stored the gift bags in the freezer until I handed them out. It was a hit! I’m sure if you were giving it as a gift, whoever received it wouldn’t mind if it was a little melted. It just might be a bit messier. They could also just stick it right back in their freezer when they got home. I made three batches and the caramel was stuck to the foil so I couldn’t peel the bark off :/ I made the caramel thick enough I think..could that be the issue? Have you had issues with it sticking to the foil? I ate what I could peel ha ha but I wanted to give it as gifts to my parent volunteers so any help or suggestions would be great! Thanks! Sorry you had trouble with it sticking! Some other readers commented that they experienced the same thing. I’ve made this quite a few times and haven’t had that problem. -Make sure the pretzels are tightly packed in the pan, so the caramel hits mostly the pretzels and not the foil. -Heat the caramel and butter mixture until it starts to form a smooth caramel mixture, pulling off the side of the pan. Another reader suggested 290 degrees. Reynold’s Wrap makes a foil that is non stick which will work. You can also grease the foil with a little butter or use a quick spray of PAM. I also had trouble peeling the tinfoil off the back of the bark. My solution was to omit the tinfoil altogether and place the pretzels and caramel sauce directly on the pan – greasing the pan is NOT necessary. After freezing the bark for the required 3 hours, I turned the pan over and banged it against my plastic cutting board and then banged the heal of my hand against the back of the pan. Voila, the bark fell right out. I make this, too, and posted it on my blog last winter. If you use a candy thermometer and get it hot enough…about 290, it doesn’t need to stay in the freezer. Erin – thanks for the tip! Yum! I even added a layer of creamy pb sauce under the caramel on top of the pretzels. Delish! I halved the recipe and make a small batch in a cake pan. a little less for me to eat. it was great! thanks! These are so good! I’m just curious if you have issues with it sticking to the foil? I’m having some difficulty peeling that foil off and wondering what I could do to make that a non-issue next time? I never had an issue with that…sorry! I would try to make sure it’s in the freezer for at least 2 hours and it’s frozen solid. Maybe that will help? Good luck! Don’t know which one fixed the problem but it didn’t stick the second time! Hope this helps. This looks yummy!!! I am going to try it, however i am not sure how much 2 sticks of butter is.. 1 cup???? Yes Maureen…it’s one cup. Enjoy! Yes you are correct. Two sticks of butter is equal to 1 cup! I’m going to make this today, it sounds delicious, does it need to be covered with anything before it is placed in the freezer??? Nope, no need to cover it with anything! Laurrie – I agree, I’m going to try using a candy thermometer next time too! Hope the party was a blast. This sounds amazing. Wonder what it would taste like with crushed peppermint candy canes for around Christmas time? Thank you for sharing. I’m renaming this Carmel Pretzel CRACK – I can’t leave it alone!! I switched it up by using tiny pretzel sticks-laying them in rows covering the entire pan bottom, mini chocolate chips and NO extra salt – fantastic!! and the Carmel doesn’t melt. Also used 1tsp. of vanilla in Carmel. I’m not sure! You could certainly give it a try, but I think the caramel candies might be too thick. If you try it, let us know! OMG these are SO good, I can’t stop eating them. I keep them in a ziplock bag in the freezer and they have become an addiction. And the best part is they are so simple to make and have very few ingredients that usually we always have on hand. Made this today with white chocolate chips instead of milk chocolate. It was absolutely wonderful! Just made this and it is yummy!! Had a hard time not eating it before it actually made it into the freezer! Looks delish! Picking up the ingredients for this tomorrow! “Snaps” work great. They’re square, so your pan space will be maximized! I used to make these years ago with saltines, but I think the pretzels will be better! Yum!!! This is the most ridiculous recipe EVER. Vague much? Sorry you weren’t a fan Ashley. Is there something that we can make more clear for you? she is probably talking about the amounts of stuff like Half a bag of pretzels? and a bag of chocolate chips? I shop at BJ’s and have a 2 lb bag of pretzels and a 72 oz bag of Chocolate chips I am sure you do not mean for me to use all that. How ever I did figure out the measurement’s on my own, it would have been easier if you had used actual measurements. but that’s OK. I think you have to be pretty dumb for this to be considered “vague” lol! I agree… there are so many sizes of the items listed. I gave it a whirl and it came out so/so… can’t help but think it’s because my stick of butter is the wrong size or I used too many or few chips/pretzels. I made this last weekend! SO yummy and easiest recipe ever! Seriously only took like 10 minutes!! Did you use Semi Sweet or Milk Chocolate chips? I’m planning to use dark chocolate – yummo! Trying these with Gluten Free pretzels!!! What an awesome idea! Found it worked better with Heavy Duty tinfoil, then rub some butter on it then put pretzels on it. That makes it easier for the bark to be removed. I made it with butter & with Margarine (parkay) Works WAY better with real butter!!! It was super popular at our neighborhood party. People couldn’t tell it was Gluten Free pretzels. Will so make many more times! Pretty great post. I simply stumbled upon your blog and wished to say that I have truly loved surfing around your blog posts. In any case I will be subscribing for your feed and I hope you write once more soon! I would definitely stir – when I made it all three times, I stirred it almost constantly. I’ve done this with unsalted butter and also “I Can’t Believe it’s not Butter” and both times, the butter and sugar melted together just fine. I did some research and read on another site that “low heat is important to prevent separation later” – maybe try that and then increase the heat once the butter and sugar are combined? Sorry for the trouble – please let us know how it works out! Thank you for this recipe – I have been doing another very simular recipe called Christmas Crack so I as I looked at this recipe I decided I could use the Flip side crackers and my family couldn’t get enough. As for the Carmel 1 cup butter to 3/4 cup brown sugar when it starts to boil let it boil for 3 minutes whisking often. I MADE THIS, didn’t just look at the picture. It was AMAZING!!!!! SO absolutely DELICIOUS and super EASY! oh my. I am going to have to go make this. Made these for a family reunion everyone loved them, I added chopped pecans on top and it was delish!! Added to the family recipe book. Mine didn’t turn out good, caramel taste burnt.. shucks! Mine is in the fridge now. The kids will love this for a after school snack. The hardest part of this is waiting got it to cool. So glad you hopped the wagon with me. any tips for someone who doesn’t have a ton of room in their freezer? a whole pan definitely wouldn’t fit, i don’t think the door would close! Thank you so much for this recipe. I can’t wait to try it out. It looks so yummy! Pingback: Salted Caramel Pretzel Bark! | More Than Pinterested. First attempt is in the freezer now. Used white chocolate chips instead of milk, but they weren’t very spreadable, so it’s more like chip form, still. Oh well, hopefully will still taste good!! Any tips on making it more spreadable?? I’ve only used chocolate chips (semi-sweet or milk) and not white, so I don’t know if that would make a difference in the melting, but I mentioned in the recipe that I like to put it back in the oven for about one minute. It helps the chips melt a lot quicker! Hey!! I made this delicious recipe for my daughter’s birthday and everyone loved it. So I put a post about it on my blog and wanted to let you know. If it’s a problem, let me know and I will take it down. Really love the recipe!! Super easy and DELISH!!!! Thanks for the recipe! LOVE IT!! I couldn’t get the chocolate chips to melt either. I have had it back in the oven for 10 minutes and now the chocolate looks weird. If you make it again, try putting the tray back in the oven for about 30 seconds. That should help the chocolate melt a little bit. Just popped these into the freezer! Cannot wait to try them!! I made this today. I wish I didnt. I am afraid i will eat the whole thing by myself! it is super delish and so easy to make. yum city. Colleen – I have the same problem! I can only make this when I have an event to go to so I know I’ll bring most of them with me Hope you liked them. I made this over the weekend, it was sinful! OMG Even my husband loved it and he do not like sweets! Would love to know the nutritional value. Haha Florence – I would NOT like to know the nutritional value. I’m sure it’s not a good number! I made this over the weekend, and it was fabulous!! Thanks!! Made thus tonight and I’m pretty sure I just gained 5 lbs…this stuff is AMAZING and would definitely make a very tasty gift during the holidays or for birthdays! Thank You! I made this tonight and I ate so much I’m pretty sure I’ve gained 5 lbs. this stuff is AMAZING and would make very tasty treats for the holidays and for birthdays. Thank You! If you love chocolate covered pretzels this recipe is for you. Super easy. Amazingly good!!! I will definitely make two batches next time. I do a very similar recipe every year for Christmas – I use saltines instead of pretzels, but I can’t wait to try it with the pretzels this year. I do some things a little differently though – rather than boiling the brown sugar and butter, I slowly microwave it to avoid burning, which seems like a common problem. Granted, the butter and brown sugar don’t mix as well as they would on the stove, but that’s never affected the how the batch came out or the taste, and really I don’t give a crap how it looks, just how it tastes, haha. I always use one stick of butter per one cup of brown sugar per batch. Don’t really know if that would help or hurt, and her batches look MUCH bigger than mine, so who knows. And dark chocolate is really good with it too. Hope this helps those who were having trouble! I like the idea of dark chocolate chips; they do that with the Sea salted caramels in Monterey CA… The combination of sea salt, caramel and dark chocolate is to die for!.. Glad I’m not the only one with the sticking to foil issue and chips not melting. I’m attempting this time with non stick butter spray and next time just melting the chocolate and pouting on top. Can’t wait to make this for my next get together! Oh my, tell me it isn’t that easy! This sounds amazing, I think a trip to the store is on my list of things to do today. Thank you for sharing! OMG – I want these now! Thanks for the recipe. These were a hit at a work potluck. I added a layer of peanut butter like another reviewer suggested. A great addition! yikes Jessica, sorry about the waste of ingredients! I hate that too. I don’t know if it would make a difference, but I made the caramel over at least medium heat and stirred constantly. As long as you’re doing 1 cup of butter and 1 cup of brown sugar, your measurements should be okay. Some other readers that commented had some good success with melted caramels. Good luck if you make it again! Oh man, I just had the same problem! I’ve been looking at this recipe for weeks. Not that I finally decided to make them for an event tomorrow, my caramel didn’t get. I too am pretty good in the kitchen and HATE wasting ingredients. Not sure if I want to try again. But my mouth is watering and boy do these sure look good! My chocolate chips didn’t melt, they dried out when I tried to spread. You think it matters if the chips are bought recently? I’ve made a similar recipe for years and never had trouble with the chips not melting until recently. I searched online and read that Nestle’s puts something in their chips now so that they hold their shape when baking with them. I tried Hershey’s in the next batch and they melted perfectly. As a single person, I typically don’t have ingredients in my pantry that most recipes say I do… well, technically, I don’t even have a pantry…what’s the point?!? But, I had to make this recipe, and guess what, all of the necessary ingredients were in my home!!! I just made this recipe this morning, it was extremely easy and the end result is delicious! Definitely something I can make for myself and be able to take “left overs” in to work the next day to share, which means I’m not eating the same thing every day for a week! I’m so glad you had all of the ingredients and that it was a “hit” for you! Do they stick to the aluminum foil? I haven’t made them yet that is my only concern. I’ve made them 3 times and haven’t had that problem. I put them in the freezer for 2 hours at least to let them cool and then the bark easily comes off of the foil (or I’ll turn it over and peel the foil off the bark). Good luck! I have made this recipe 3 times now and each time they have turned out slightly different… all delicious though! The first time I made them, I don’t think I cooked the butter and brown sugar long enough because I could still feel a little crunch of sugar and it was lighter in color than in the photo. I used a smaller cookie sheet and halved the recipe. I used closer to 3/4 of a bag of chocolate chips because half of the bag didn’t look like enough chocolate on top, and I love chocolate (who doesn’t!). The second batch I made, I cooked the sugar and brown sugar longer but I still wasn’t sure when I should take it off the heat. I got a nice brown caramel color and was easier to break when it was out of the freezer than the first batch. The third time I made them, I cooked the butter and brown sugar even longer, which I thought brought out even more of a caramel flavor. Overall, it is hard to tell when to take the butter and brown sugar off the heat. I would say maybe 8-10 minutes is good on the stove, although i’m sure other people have had different success. I used aluminum foil and once it has been in the freezer for at least an hour, you do have to “pry” them off the foil and break up into pieces. And most importantly, they should be kept in the freezer!! If you leave them out of the freezer, the caramel and chocolate get soft and its not nearly as delicious as straight out of the freezer. I can see this being a staple in my house from now on because it is such an easy treat. Thanks for the amazing recipe! I’m so glad you liked it! I’ve found that if you heat the butter and brown sugar until it’s actually a caramel (and not just combined) then you don’t have to leave it in the freezer. But I thought that at first too. You can get a candy thermometer and heat the butter/sugar mixture until about 340 degrees (or so I’ve read on some sites). 340 would be SO burnt!!! 285 to 300 is hard crack stage. Thanks for the recipe. I made these and took to work. Was a big hit and everyone wanted the recipe. I will be adding them to my Christmas goodie basket I hand out every year. Thanks again. Thanks for the recipe! My first batch is in the freezer now! I had no problems with the caramel, turned out perfect! It’s ard now waiting for it to set in the freezer! All ‘samples’ were delish!! Mine turned out incredible!! We love them straight out of the freezer so no mess for us! Thank you so much, just love them! Also just to add used half semi sweet and half milk chocolate hips. Think will use all milk chocolate next time!! I am looking for things to send to my husband in Afghanistan. Do you know how well this will keep to send overseas? How long would it last if sealed in an airtight container? It’s been taking about a month for him to get care packages. These are FABULOUS! My first try and they turned out to perfection. I did read all the reviews first before taking my turn at these treats and here’s a few things I was SURE to do: I purchased heavy duty tin foil with non-stick, not one issue at the end when peeling off the foil. Also, I was sure to stir the butter/brown sugar the entire time bringing it to a slight boil for about 2 min and cooking it for about 6-8min…it does get thicker the more you stir and simmer. I used dark chocolate and the chips melted without putting back in the oven. I used a small spatula and just worked it up and down until the chips were melted and the pan was covered evenly. This is a great recipe! Bringing these treats to Thanksgiving dinner for our dessert buffet. Thanks!! It looks amazing and I’m anxious to try it. My only comment is that brown sugar and butter do not make caramel, they make toffee. I suggest if you’re having difficulty with the brown sugar and butter mixture that you check a toffee recipe. These have been a hit whenever I make them! Made this yesterday and it’s gone today! Used milk chocolate chips and heath toffee pieces and pecans. The toffee is yummy! Heavy duty foil is best for non stick removal. Thanks for the recipe. I will be making this for some simple Christmas gifts! Made these yesterday gone today. I used milk chocolate chips and heath toffee pieces and pecan pieces. Yummy! Thanks for the recipe. Will be making these for Christmas gifts! Heavy duty foil will help with non stick removal. Hi! I just wanted to point out that I made this, and I’m pretty sure that what this is is more butterscotch than caramel. Just to let you know in case you are expecting caramel! I want to try this. Yummy! I had a super hard time getting the aluminum foil off of the bark when I was finished… Do you have any advice? I used Reynolds Heavy Duty Non-Stick Foil. Came of easily! More expensive, but so worth it!!! This sounds like a wonderful idea, but “Bring to a boil, and stir continuously until mixture sticks to the bottom of the pan and forms a smooth caramel.” is awfully vague. In my experience, if you stir sugar while making a caramel, you will cause crystals to form making it granular, like fudge- not crisp like toffee. Are we talking soft ball stage or hard crack? What temp do you cook the caramel? Candy making is precise. It is very difficult to make a good caramel without the use of a candy thermometer. Put butter, sugars and water in a saucepan over medium-high heat. DO NOT STIR. When butter melts, gently swirl pan to mix with sugar. Clip on a candy thermometer and cook to 285 degrees (hard crack). Remove from heat and stir in 1 teaspoon vanilla extract (careful, mixture will bubble a bit) and 1/4 teaspoon baking soda. Stir until well blended. Pour evenly over pretzels laid out on a PARCHMENT lined baking sheet. While toffee is still hot, sprinkle chocolate chips on top. Allow chocolate chips to melt on warm toffee for 5 minutes, then spread into an even layer. Let cool 10 minutes on the counter before putting in the fridge to set. Break into pieces and enjoy! You can also pour the toffee mixture over chopped, toasted pecans, almonds or hazelnuts (instead of pretzels) to make an amazing buttercrunch toffee. For clarification, this recipe calls for a crunchy toffee, not a chewy caramel. If you make the toffee, you will not need to store it in the freezer. If you use melted store bought caramels, you will need to refrigerate it because it will be more like a “turtle” candy and will soften at room temperature. Either way, it is delicious- just a different consistency. Just wondering, do you think it would freeze well until Christmas? I’m trying to get some baking done ahead of time for my goodie tins. thanks, i AM into the details. But I’m presuming this is an American Recipe; which is why I have no idea what a “STICK OF BUTTER” is. Can anyone please put in the weight of butter that’s required? Doesn’t matter if it’s in imperial or metric, I can convert it to metric. Unfortunately “STICK” doesnt convert…!?!? A stick of butter is equal to 1/2 cup of butter…so this recipe calls for 1 cup of butter total. Fabulous, thank you Mary Ellen M.
Thanks for the additional recipe! I used the recipe that I found (and credited) so I apologize if the directions were vague. You can see in the pictures that it butter and sugar forms a smooth caramel (not toffee, soft ball or hard crack). Another commented suggested letting it reach 290 degrees. I just used this recipe and it seems to have worked out well. I plan on keeping it out this evening for our Christmas Eve buffet so I wanted to make sure it could withstand room temperature for an extended period of time. It took a while to get the candy thermometer to read 285F, but I think I got there! I also added unsalted whole almonds on 1/2 of the sheet for the nut lovers Yum! I’m so glad you gave it a try and it worked out for you! I added a little corn syrup along with some cream before I cooked the caramel and then I cooked it to a ‘soft ball stage’ to make sure it turned out…butter is way too expensive not to make sure it’s going to turn out….and it was amazing!!!! Thanks!!! Can I use jarred caramel instead of making my own? Please, please say its doable! Thanks! Pingback: Five Ingredient Peanut Butter Cup Bars | Mama Say What?! Note to all of you that make this..
Oh my goodness! I’m glad your kitchen was okay and I agree…I’ve done it before with crushed Heath bars on the top…so good! I love this, thank you! I used dark chocolate chips yesterday and wasn’t as impressed. The first time I made it I used 1 cup of milk chocolate chips and 1 cup semi sweet. What do you use….milk or semi sweet? I used semi-sweet, but that’s what I usually use for baking, so it’s what I had in my pantry! If you’re a dark chocoalte fan, I’m sure it would taste great, but I haven’t tried dark chocolate in this recipe. I just made this… and after the caramel wouldn’t thicken… I realized that maybe my problem was that I used margarine instead of butter????? Whhoops! It’s in the freezer… so hopefully it still freezes…. If not, I’ll try again with real butter sticks. Alisha – let us know! I’ve done it before with “I Can’t Believe it’s Not Butter” and it turned out fine. Would love to know if margarine is an option. These look absolutely delicious. I’ll definitely be trying to make this before Christmas! I just took these out of the freezer.. YUMMY. My 11 year old son made them as Christmas gifts. We used store bought caramels and melted them on the stove. We made two large cookie sheet trays – one with semi-sweet chocolate chips, one with dark chocolate chips. We used parchment paper and had no sticking issues at all. I think next time I would use mini pretzel sticks for more pretzel flavor, 1 and 1/2 bag of choc. chips and 3/4 a bag of caramels per cookie sheet. Making these for the second time! I the first batch came out perfect, today however I made the mistake of not constantly stirring the caramel! I had to remake the double batch! But the new batch came out great! I mixed white and milk chocolate chips, this time and used all white last time. It was delicious! Everyone loved it! Will make this again and again! Thanks for sharing! This is as good as she says it is! I made mine with white sugar (out of brown) and it worked just fine. I just added a splash of vanilla. I also used the Wilton light cocoa wafer melts instead of chocolate chips. I think they taste much better than chips. I used parchment paper and had no sticky issues. I only had it in the freezer about 30 min. Anyway, the recipe is as easy and tasty as it looks! Ummm, yummy! I was drooling over picture number 2! These look delicious! My family lives in China, where it’s hard to get lots of ingredients for Christmas treats. I’ve made 3 batches of these and they are SO SO SO delicious, particularly popular with my husband! My first batch stuck to the foil so badly, we had to cut off lots of the food to remove the foil. I’ve since been making this on a non-stick jelly roll or sheet pan (with sides, to keep the caramel from oozing off). Pops right off out of the freezer! Thanks for the post…. a new Christmas (or anytime I can find pretzels!) favorite! If you have any tips on EGG NOG, I’m all ears!!!! Merry Christmas from China!!! Looks amazing. Tastes great but my caramel did not turn out. Sat in freezer for 12 hours and it was still sticky. Next time I will try a different way of making caramel. I also sprayed Pam on foil, that helped a lot with getting this out of foil and broken up. I made these last night at a cookie making party and wanted to leave a quick comment to address the many comments related to the caramel not setting up. After reading through a lot of the posts, these are the tips I followed which resulted in a PERFECT batch!! These cookies are too easy and good to give up on, so hopefully this will help others avoid “caramel pitfalls”!! 2 – You MUST cook the caramel mixture to 290 degrees, stirring constantly (you’ll need a candy thermometer) or it won’t set up properly. It won’t need 2 hours in the freezer either if you cook it enough…mine set up in under 30 minutes and stayed that way. 3 – I sprayed the aluminum foil with non-stick spray to make sure it didn’t stick…the foil peeled right off! Made this today! Tastes so good. Just a few things: I used foil to line the pan, sprayed the foil a little, and then put a piece of parchment down. No sticking issues. Also, not to get technical but isn’t this more of a toffee? It still tastes great but I think next time I will add a little cream to make it caramel, it tastes way different from when I pulled it off the burner to when I pulled it out of the freezer. Still good though!! Thanks! I love love this recipe made for the second time today, both times completely successful. I like to melt the butter first and then add the brown sugar, takes a bit to fully combine but works great both times I’m giving as gifts for Christmas and its hard to not snack on them… Haha can’t beat chocolate and pretzel combo! This stuff is sinful and evil, LOL! I attribute this to my 5 lb holidday weight gain! I have made this twice now and it’s so good-I combined dark choc with milk choc and it was great, although I definitely think there is a trick to the caramel part, as the second time I made it I cooked the caramel longer and my husband didn’t think it was as good. I have made this twice with absolutely no problems. I suspect that some of the problems some are having with runny caramel are not cooking the mixture long enough. I cook over medium heat, and stir constantly. Once it amalgamates into a bubbling blob, continuing to stir, until it really thickens–that might take another 8 to 10 minutes. I took it to a quilt retreat and have been told that I have to bring it to all future retreats! Great stuff! I made this tonight, & it is hard to stop eating!!! My family loves it! This turned out beautiful. I took the advice and used my candy thermometer and got the temp to about 285 degrees for the caramel. The final product is gorgeous. The candy bark stays together even at room temperature so no absolute need to keep it in the fridge or freezer (though I do that anyway). Thanks! Planning on making another batch today! I made this for the very first time this Christmas. It was so amazingly good! I shared it with some friends and they want the recipe! That’s how good it is! I also used the non-stick foil…it worked extremely well. I discovered this recipe the Thursday before Christmas and it FOUR times around Christmas. I just made yet another tray of it. It is a SMASH HIT. I’ve also shared the recipe several times. Thank you so much for sharing this recipe. I’ve made two batches, and both were great (the second was a bit better, because the caramel never got sticky, even after the bark was sitting out at room temperature). Thanks, again, and happy holidays! as it’s likely to not do well in the heat. Thanks for sharing! I made this to put in my goody boxes at Christmas. It was so easy and very tasty!! Trust your gut when you think baking caramel on aluminum foil is a stupid idea! It is. Otherwise this is a delicious mess. This is a great, easy recipe!! I’ve made it several times since I”ve found it, and every time someone has asked for the recipe!! I don’t put any foil or parchment paper in the pan, I just spray it really well with cooking spray, and everytime it has come out easily (I turn the pan upside down and if it doesn’t come out on it’s own, I just bang it on the table a little). Thanks for the recipe. I’ve made this a few times now and if you’re concerned about the butter/brown sugar part I’ve never had trouble with it. I just combine them in the saucepan and stir it pretty frequently over low-med heat and let it bubble for maybe 5-7 ish minutes. Oh my, this combines some of my favorite things! Maybe I can con, I mean as my Aunt to make me some up. oh my goodness, those look so dangerously good!!! You must not be a candy maker! Candy has to be cooked from soft ball, hard ball, crack, or hard crack. 265 degrees to 300 degrees. I just made this last night and cooked it to hard ball. It came out perfect and sat on my counter ALL night. ad MMMMMMMMMMMmmm it was delicious! FYI do not use choc chips from Aldi, they are tasty but do not set up. It took around 10 min on med to low heat. to cook the caramel! If you’re going to post a recipe involving candy (which is what caramel is) you really should be precise. I shouldn’t have to go through 200+ comments to find out that I needed a candy thermometer and what temp it should come to. My caramel never thickened properly and when I poured it over the pretzels I took 10 minutes meticulously laying out in the pan, everything waved up and I had pretzels 2 and 3 deep that I spent half an hour separating and putting back into 1 layer. I made this today. It stuck to the foil. I don’t think I cooked the caramel long enough. It thickened, but I was afraid to leave it on the heat too long for fear of burning it. It tastes more buttery than caramel and it softens quickly outside of the freezer. Overall, it tastes good. I will definitely try it again and cook it longer. When I put my pretzels with caramel in the oven the caramel crystalized and became all flakey do you know if this means I over or under cooked the caramel? I have troubles getting the bark off the foil. It stuck so badly i had to throw out a whole batch. Wondering if wax paper would be better. Kelley – sorry you had a hard time with it. What a waste of a batch! I’ve never had a problem with foil and I’ve done it the exact same way at least 5-6 times. My only thought was maybe it wasn’t cooled in the freezer long enough? Sorry! Let us know how it comes out using waxed paper. The pretzel bark recipe sounds amazing. I had just one question. For the chocolate chips, do you use semi-sweet or milk chocolate? Hi Susan! I usually use semi-sweet because that’s why I usually have around the house for making cookies. But I think milk chocolate would be great too! This turned out excellent, except next time I’ll skip the sea salt as it was a bit too salty for my liking. A friend of mine brought this to work and everyone loved it! I requested the recipe, but she forgot it so I set out on the Internet to find the recipe. Good thing I did–I found your blog! Excellent recipe! Thank you for posting it. I’m trying this recipe out for my book club, and have a few questions before I get started. 1) Does parchment paper work ok? 2) Light or brown sugar? *The above post should say light or *dark* brown sugar. Thanks! Can I use margarine in place of butter? I plan on making this and giving as a gift. How should the bark be stored? ie tight container, tin, paper? Any suggestions as to how not have it melty? I’m having issue with the chocolate melting? I used Nestle semi sweet chips and they hardly melted? now I’m afraid to burn the chocolate…..
I’ve never had issues with the chocolate melting before and I’ve used them all! After the pretzels and caramel come out of the oven for 5 minutes, I put the chocolate chips on immediately. The heat should melt them on their own (or I usually stick them in the oven for 30 seconds – 1 minute to help the process along). They should be easy to spread that way. Good luck! Going to try this! Is parchment paper good, or is aluminum foil better in terms of what sticks less? Val – I always use foil! it seems to need more caramel and the chocolate chips are not melting after I put back in oven at the end for 5 minutes????? Thank you! Mine came out perfectly!!! Do you recommend dark or light brown sugar? Marybeth I always use light brown sugar (because I prefer the taste) but dark brown would be delicious as well! Looks amazing, I am going to have to try this. Thank you. I make this every Christmas – everyone always requests it. It is so yummy and so easy! I do melt the chocolate instead of putting the chips on the toffee. More consistent that way for me. I made this and my family loved it. I use the cup of ice water trick and drip some cooking carmel into the water to see if it get nearly brittle, no longer gooey then spread it over the pretzels (salted or nonsalted at don’t see a difference as you get the salt on top too). I keep in the freeze in a baggie or tupperware covered in the hotter months and at xmas, I don’t have an issue with it getting sticky again. Delicious! Has anyone tried making a vegan version of this? Maybe with vegan “butter?” I would love to try making it for a friend whose family is plant – based.